Cut a piece of plain foam 15cm by 8cm and punch a hole in the centre of each long side. Cut a 6cm diameter circle from brown self-adhesive foam and stick on two smaller white circles to make cheeks. Add two wiggle-eyes just above the cheeks. Add floppy ears, a nose, and whiskers made from self-adhesive foam. Add directions spelled out with foam letters and an arrow shape to the remaining space on the sign. Mount the sign on a short, thin plant cane by threading it through the holes. 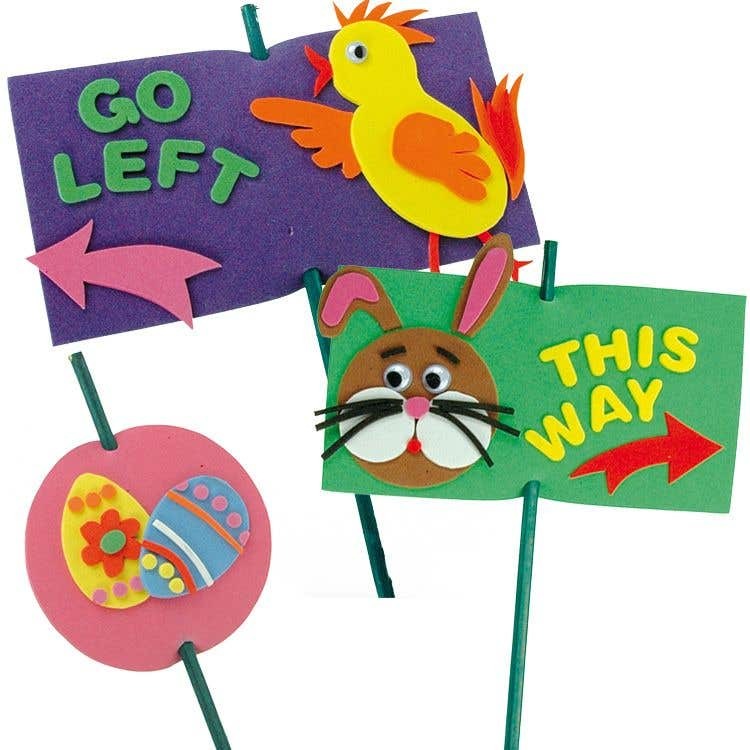 Make lots of signs with different characters on them and place around the garden & home then wait for the fun to start! If you are doing this for young children it would be a good idea to wrap a thick streak of foam around the top of each cane to avoid accidents.